We all know that light can be both harmful and beneficial for our vision as well as our overall health. Here, I'll provide a background on ultraviolet (UV) light and blue light. Sunlight contains UV and blue light. UV light is part of the non-visible light spectrum and we are exposed to it every day when we're out in the sun. It can cause damage to our eyes, particularly the cornea and the lens. The cumulative effect of UV exposure can con tribute to cataracts as well as the potential for pinguecula and pterygium. Blue light, which is part of the visible light spectrum, reaches deeper into the eye and its cumulative effect can cause damage to the retina. Furthermore, in certain wavelengths, blue light is implicated in the develop ment of age-related macular degeneration (AMD).1–3 The amount of exposure to blue light varies, depending on the time of day, the location and the season. The average proportion of blue light that's found in sunlight during the day is between 25% to 30%. Even on a cloudy day, up to 80% of the sun's UV rays can pass through the clouds. Visible light covers the range from 380 nm to 780 nm and UV light falls just beyond the shorter end of the visible spectrum, so it's invisible to the human eye. It is divided into three zones: UVA, UVB and UVC. UVA is between 315 nm to 380 nm, and is the least damaging of the UV light. Tanning is the most popular effective UV exposure. UVB is between 280 nm and 315 nm, and has more energy. It is more energetic and fairly damaging if we're exposed to it on a day-to-day basis. Acutely, it can cause sunburn and destruction of vitamin A. In more chronic forms, it can lead to skin thickening, wrinkling and possibly damage to DNA, which can lead to mela nomas and other skin disease. So exposure to UVB is cumulative to both the body and the eyes. UVC is in the range of 100 nm to 280 nm, and is the most biologically active of the UV light. Brief exposure can create permanent damage to human tissue. Fortu nately, UVC is absorbed mainly by the ozone layer in the upper atmosphere. To review, UV light can have an additive effect to damage the eye and can be a major risk factor for the formation of cataract cell life. It's important to remember and to keep emphasizing the fact that not all blue light is bad. Furthermore, blue light also helps to regulate our pupil size around the wavelength of 480 nm. Many environmental factors such as location, season, time and lifestyle can affect UV risk. Contrary to what many people believe, the time when maximum amounts of UV reaches the eye is not consistent throughout the year. Specifically, in the summer between 10 a.m. and 2 p.m. is the highest level of UV exposure, but in the winter, this maximum exposure is going to be between 8 a.m. and 10 a.m. and between 2 p.m. and 4 p.m.
Just as UV light is dangerous to our skin, it's also dangerous to our eyes. So it's important that we protect them from UV damage. UV light affects the front of the eye (cataract formation), while blue light causes damage to the back of the eye (risk of AMD). Nowadays, there's an increase in the use of digital devices and modern lighting—such as LED lights and compact fluorescent lamps (CFLs)—most of which emit a high level of blue light. CFLs contain about 25% of harmful blue light and LEDs contain about 35% of harmful blue light. Interestingly, the cooler the white LED, the higher the blue proportion. And by 2020, 90% of all of our light sources are estimated to be LED lighting. So, our exposure to blue light is everywhere and only increasing. Essilor had a partnership with Paris Vision Institute in 2008 and their directive was to find the bands of visible light that were the most harmful to the eyes.10 They split the visible light into multiple bands of 10 nm and each band was then focused on porcine retinal pigment epithelial (RPE) cells for several hours. So using this method, the specific band of blue light most harmful to the retina and to the RPE cells was identifi ed to be at 415 nm to 455 nm. The blue-violet light that was discovered as part of this study is a 40 nm band of visible light that causes the maximum retinal cell death. Over time, our eyes are exposed to various sources that emit this blue-violet light (e.g., the sun, LED lighting, CFLs). Combine that with the use of tablets, TVs, computer screens and smart phones, and there's no doubt our exposure to blue-violet light is on the increase. This cumulative and constant exposure to the blue-violet light is going to accumulate over time and has the potential to cause damage to the retinal cells, which is going to slowly lead to retinal cell death and can in turn lead to AMD. The level of light emitted by newer energy-saving lighting techniques (e.g., LED, CFLs) is very high. For example, CFLs, white LED light and even sunlight emit high levels of blue-violet light compared to the rest of the blue light spectrum. 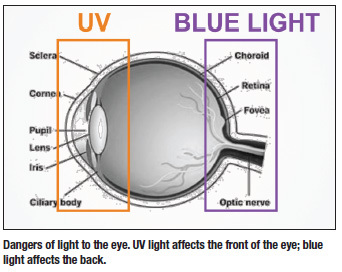 This underscores the need for us to protect our eyes from the harmful bands of blue-violet light. Not all blue light is bad. The labeled blue-turquoise light range, which is from 465 nm to 495 nm, is essential to our vision, the function of our pupillary reflex, and in general to human health. It also helps to regulate our Circadian sleep/wake cycle.11 So blue light in general can have healthy affects on vision as well as the body, and it is this blue-turquoise light that tends to have these beneficial effects. Inadequate light exposure means inadequate blue-turquoise light, which can throw off our Circadian biological clock and our sleep/wake cycle. So this blue-turquoise light really plays a vital role in the general health of the individual. How can we block the harmful blue rays of light but allow the helpful blue rays of light to penetrate through and get into the eye? Essilor and the Paris Vision Institute established a goal of finding a selective light filter or a lens to block out UV as well as the harmful blue-violet light and yet allow the blue-turquoise light and the longer wavelengths of light to continue to penetrate through it. They did this with Light Scan, a patented, selective, noglare technology with three key features: 1) it selectively filters out harmful blue-violet and UV light, 2) it allows the beneficial visible light, including the blue-turquoise light, to pass through and 3) it maintains an excellent transparency of the lens, so there's no color distortion and you get excellent clarity with the lens. They ended up providing a lens with front-side as well as back-side protection. The front side of the lens defl ects UV light as well as about 20% of the blue-violet light to then defl ect away the harmful rays. And the back side protects the patient from the refl ective glare that comes off the back surface of the lens, mainly from UV light. Traditional blue blockers give you pretty sunsets, but that's not what you want. You don't want color distortion; you want your colors to be natural. The traditional blue blockers do not discriminate in the blue light spectrum. They just block all the blue light. This new lens technology is based on laboratory studies over a four-year period of time by a high-class group of scientists as well as clinicians who came up with some very important data that allowed them to zoom in on the light that needed to be blocked and the light that needed to get through. So this new lens design really is very specific for more selective light. Who's going to need the most protection? 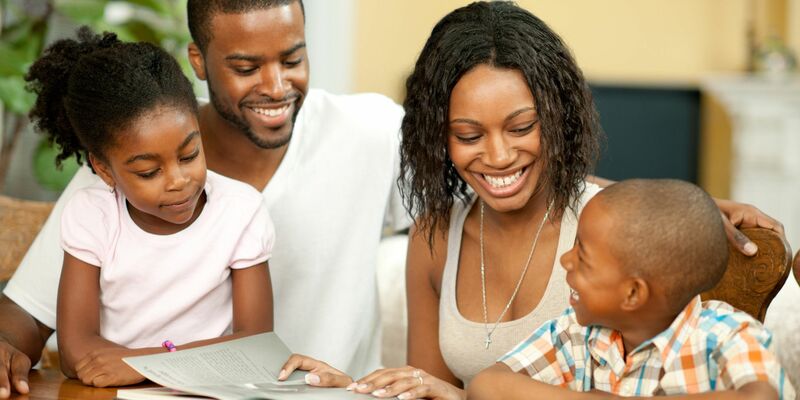 Those who have high exposure to white LED or fluorescent light bulbs in offi ces and homes, frequent users of LED computer monitors, tablets, or smart phones, and those at risk for AMD, particularly those at high risk, (those with family history, smokers, etc.). Many companies are working on technology to look at harmful blue light and ways to block that and still allow healthy blue light to remain. We know that patients at risk for AMD need to protect their eyes from harmful blue-violet light, so we need to get up to speed educationally on what's going on there so we can properly educate our patients. Not only do we look at our AMD patients and determine whether to recommend nutritional supplements to them, but we also have to work at giving these patients protection against both the UV invisible light as well as the blueviolet light spectrum. Optical companies that currently offer blue-blocking technology include Nikon (SeeCoat Blue), Essilor (Crizal Prevencia), PFO Global (iBlu coat), HOYA (Recharge), VSP (UNITY BluTech) and Spy Optic Inc. (Happy Lens). We need to be asking patients if they currently protect their eyes on a daily basis, if there is a family history of macular degeneration, and how much time they spend in front a digital device or computer. We also need to find out if our patients are currently protecting their eyes against UV damage, so there's a lot of homework out there for us. These are all questions that are going to come to the forefront as this new technology continues to evolve. Dr. Melton practices at Charlotte Eye Ear Nose & Throat Associates, P.A. and is an adjunct faculty member at Indiana University School of Optometry and Salus University College of Optometry. He has authored and co-authored more than 100 articles on eye diseases and eye care for peer-reviewed journals and magazines and has served as an investigator or co-investigator on more than 50 clinical research activities. Beatty S, Koh HH, Henson D, Boulton M. The role of oxidative stress in the pathogenesis of age-related macular degeneration. Surv Ophthalmol. 2000;45(2)115–134. Algvere PV, Marshall J, Seregard S. Age-related maculopathy and the impact of blue light hazard. Acta Ophthalmol Scand. 2006;84(1)4–15. Dillon J, Zheng L, Merriam JC, Gaillard ER. Transmission of light to the aging human retina: possible implications for age related macular degeneration. Exp Eye Res. 2004;79(6)753–759. Wooten V. Sunlight and sleep. Discovery Fit and Health. Available at: http:// health.howstuffworks.com/mental-health/sleep/basics/how-to-fall-asleep2.htm. Accessed: January 2014. How your internal "body clock" affects sleep. Helpguide.org. Available at: http://www.helpguide.org/harvard/sleep_cycles_body_clock.htm. Accessed: January 2014. Vision Problems in the U.S.: Prevalence of Adult Vision Impairment and Age-Related Eye Disease in America, Fifth Edition. Prevent Blindness America, 2012. Available at: www.preventblindness.org/visionproblems. Accessed: December 2013. National Eye Institute. Available at: http://www.nei.nih.gov/eyedata/cataract.asp. Accessed: December 26, 2013. AMD Alliance International. Available at: http://www.amdalliance.org/information_overview_basic_facts.html. Accessed: December 26, 2013. Singerman LJ, Miller DG. Pharmacological Treatments for AMD. Review of Ophthalmology. Oct. 2003. Smick K et al. Blue light hazard: New knowledge, new approaches to maintaining ocular health. Report of a roundtable sponsored by Essilor of America. March 16, 2013, NYC, NY. Researchers use blue light to treat sleep disturbances in the elderly. Lighting Research Center. 2005; April 14. Available at: http://www.lrc.rpi.edu/resources/ news/enews/Apr05/general245.html. Accessed: January 2014.